At the September 14 Town Hall hosted by Beaches-East York MP, Nathaniel Erskine-Smith, yours truly attended as one of the panel members. There, I spoke about the top six ways in which each individual or household can do their share to reduce their environmental ‘footprint’ and impact on climate change. I could only say so much in the four minutes each of us was allocated, so I decided to share and expand on those points here. For this purpose, let’s set aside the other major emitters from oil and gas production (the greatest contributor at 26 per cent of total greenhouse gas emissions, using numbers from Environment and Climate Change Canada, 2016) and electricity and heat generation (11 per cent). These are not easily reduced by actions from individual households, other than through advocacy, boycotts, and voting for governments promising to improve on those sectors (see point six). The following six areas are the greatest GHG emitters in the areas where personal changes to our habits can reduce our impact – starting with the most impactful areas – with suggestions on how to reduce our footprint. Transportation Transportation is the second greatest contributor, with personal and freight transportation responsible for 23 per cent of total national emissions, according to Environment Canada. Despite better fuel efficiency of both passenger cars and light trucks in the past decade, the North American habit of driving SUVs, vans, and small trucks for personal use has eliminated any emission reductions and, in fact, has driven emissions up. Your Footprint: Buy a passenger car instead of SUV or truck, buy a hybrid or electric car, limit how much you drive by car-sharing, using public transit, and cycling or walking more often. You may also reconsider reducing air travel – can you get to nearby places by bus or train? Your Home Buildings are one of the next largest contributors. Everything on the outside and inside effects the environmental footprint of your home. This includes construction materials used, the quality of your insulation and windows, and efficiency of heating and cooling, as well as your interior design, and furniture and personal possessions. The amount of ‘stuff’ we put in our homes also emits pollution during its production and transportation processes, and later in its disposal. 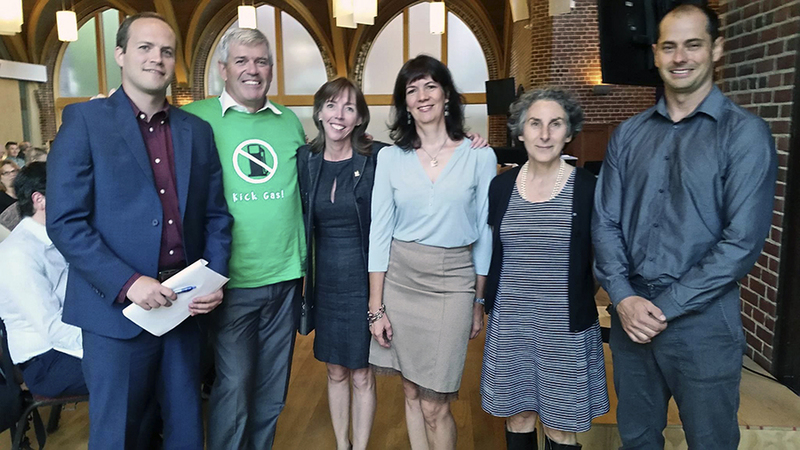 Beaches-East York MP Nathaniel Erskine Smith, Beaches-East York MPP Arthur Potts, Ward 32 Councillor Mary-Margaret McMahon, environmental consultant Martina Rowley, Julia Langer, CEO of the Toronto Atmospheric Fund, and Toby Heaps, CEO of Corporate Knights, at the Climate Change Town Hall September 14. Your Footprint: If possible upgrade the insulation, energy, and water efficiency of your home. Keep heating and cooling temperatures moderate, i.e. don’t overheat or overcool your living spaces. Switch to a green energy provider, like Bullfrog Power or other low carbon and renewable sources like wind, hydro, bio fuels, solar. Consider installing solar thermal panels for hot water generation and/or solar PV (photo-voltaic) for electricity generation or participate in a renewable energy project, like our local Beach solar project on Kew Beach school. Reduce the amount of ‘stuff’ you buy for your home and personal use and consider the 5 R’s: rethink (do you really need a new …? ), reduce, reuse, recycle, repurpose. Food Agriculture is another large contributor. Raising animals at an industrial scale to meet our local demand for meat, as well as exports, is taking a toll. Large areas of farmland and water are required to grow vegetable feed for animals. The industrial sized barns of intensive animal farming generate toxic sewage, often stored in outdoor ponds that are prone to leaking into the groundwater or surrounding soil. The animals themselves – specifically cattle – are one of the biggest contributors to methane generation, a gas that is more toxic than carbon dioxide (CO2). Watch the documentary Cowspiracy for details – you can find it on Netflix. Decomposing food in landfills emits 3.3 billion tonnes of GHG per year, including methane. In Canada, over $31 billion worth of food is wasted every year, and households are the largest culprit, wasting 47 per cent – that’s $14.6 billion dollars’ worth – of food. On average, households waste $900-$1500 of spoiled food per annum (see my column from April 2015). Your Footprint: Buy more locally grown foods, buy organic as often as you can afford to, support local farmers’ markets, eat less or no meat – especially beef – or perhaps consider becoming a vegetarian or vegan. Strive for better meal planning and food storage. Stormwater Management This point and the next are less about reducing emissions, and more about preventing and mitigating the effects that climate change related weather has on our shared and personal infrastructure. Based on changes in the weather pattern from the last decade, as well as predictions for the next years, we can expect more extremes in weather. As we have already experienced, that means hotter summers with more drought conditions and stronger storms that result in more flooding and damage, including damaged power lines and other infrastructure. 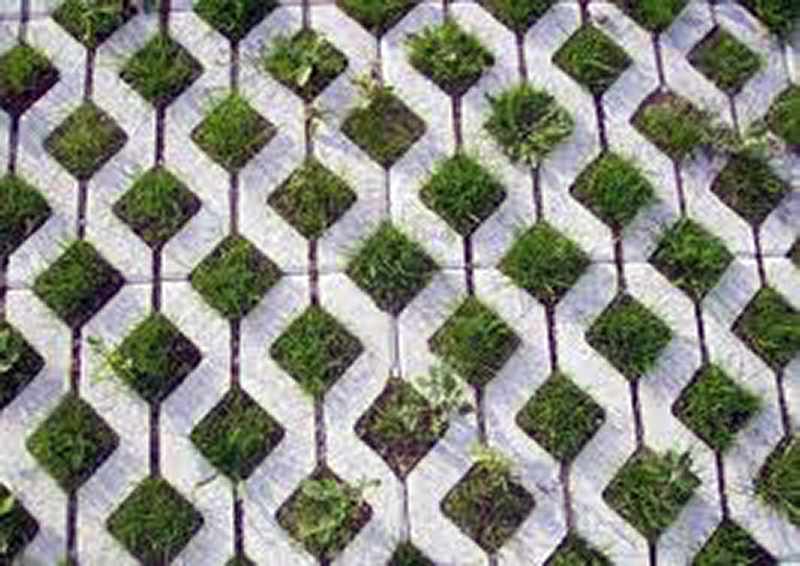 Your Footprint: Switch your driveway to permeable paving, e.g. gravel, or open pavers; connect your downspouts to water barrels or, even better, install a raingarden. They let 30 per cent more water into the groundwater, prevent water from pooling and getting into your house, and increase the natural habitat with native drought-resistant plants. According to Mark Cullen, Ontario’s own home and gardening expert, some home insurance providers offer reduced rates for installing such Low Impact Development. Parking lots can also install Bio swales to channel rainwater. Toronto and Region Conservation Authority has put together a booklet on how to better manage stormwater and install a raingarden. Resilience and Emergency Preparedness This is another aspect to best be preventative about, rather than reactive when something has already happened. The Beaches and East York region have had their share of hydro blackouts in the last few years, either following heavy summer storms or ice storms. Being at least a little prepared before an emergency can go a long way for your peace of mind and safety at home. The City of Toronto has hosted numerous information events on resilience and emergency preparedness in the last few years, and their Office of Emergency Management has useful information and checklists on their website and available as brochures. Your Plan: Have an emergency bag at home, and an emergency plan for your family and loved ones. Buy a generator (and learn how to use it safely). Form a local support network to help neighbours or seniors in the area in an emergency situation. Know how to get to your nearest cooling centre or public building, like a library or community centre. Vote for and participate in progress and environmental programs Last but not least, participate in and vote for local, provincial, and federal leaders who are promising and acting on climate change to lower our collective impact, as well as putting programs in place that benefit and assist citizens. For any of the above, find out from your local councillor, MP, or MPP which programs, grants, or community groups exist to support your efforts in reducing your environmental footprint.